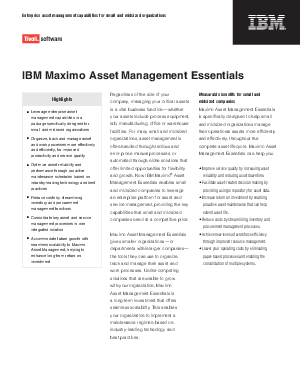 > IBM > IBM Maximo Asset Management Essentials €”turning data into valuable information. Regardless of the size of your company, managing your critical assets is a vital business function. This datasheet will show you how Maximo Asset Management Essentials is specifically designed to help small and midsized organizations manage their operational assets more efficiently and effectively, throughout the complete asset lifecycle.